The number of plumbing pipe products on the market has never been greater. In order to simplify the selection process, we’ve put together a guide for choosing the right pipe for your project. The materials covered are based on readily available products in Brisbane’s domestic and commercial plumbing market. Trusty old copper pipe. While it is often labelled as expensive, there is a reason this product is still a go-to for plumbers and gas fitters alike. Copper pipe is reliable, practical and suitable to a wide number of plumbing applications. With the introduction of crimp fittings such as b-press, copper pipe is just as relevant as ever in today’s market. – Durable and long lasting. – Universal and easy to retrofit and repair. – Can be used for cold, hot and gas pipework. – Easy to join via soldering, compression unions or crimp fittings. – Copper pipe and unions are generally more expensive when compared with PEX and polly. – Crimp Fittings (B-Press) are not cheap and quickly add up on bigger jobs. Pex pipe (Cross-linked polyethylene) is the newest generation in plumbing pipe technology. It uses a durable plastic composite to create a cost effective plumbing solutions. Due to its low cost and ability to be installed very quickly, it is extremely common in new builds. When using PEX pipe, it’s always a good idea to store some extra unions and pipe away for future works. – Low material cost when compared with copper. – Fast and easy to install, HOWEVER, you must have the right tools for the specific brand of pipe. – Available in long lengths which is convenient for bigger jobs. – Longer projected lifespan then polly pipe. – An abundance of products are available on the market makes selection difficult. – Trying to identify and connect onto PEX pipe is a plumber’s worst nightmare. – Crimped fitting are more prone to leaks. This can be a problem down the track, especially if the join is inside a roof or wall cavities. – There are a number of limitations on where you can use pex pipe. Such as hot water and high pressure services. – Requires the use of specialised heads and crimping tools. Polly pipe is a cost effective and readily used plumbing material. Not to be confused with irrigation pipe, which does not carry the blue stripe, blue line polly pipe is suited for use with potable water. Polly pipe is very common through houses in Brisbane and was the leading alternative to copper pipe prior to the recent rise in PEX. – Fast and easy to install, especially for long underground runs. – Available in blue-line (drinking water/ potable) and black (irrigation/ non-potable). – Prone to damage during excavation. – Reduced life compared with Copper and Pex Pipe. – Requires careful bedding to ensure a long life. – Not suitable to locations with UV exposure. Selecting the right pipe material really comes down to application. As plumbers who are constantly working in maintenance, nine times out of ten copper pipe is still our first preference. For larger projects, however, PEX pipe is becoming the plumbing pipe of choice as it can be supplied and installed for a fraction of the price. Polly pipe has somewhat been left behind in today market however will continue to be used for repairs and maintenance. 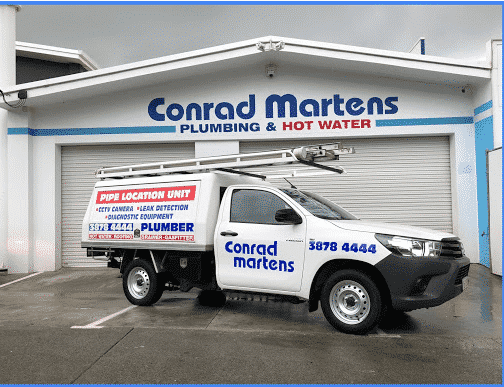 For a professional opinion on what plumbing pipe will be best suited to your project, call Conrad Martens Plumbing on 3878 4444. We have experienced plumbers and gas fitters who are up to date with the latest product information.